If you are friends with former or current military members, you may have noticed basically a different language used when discussing his/her experience, or terminology used to describe everyday items. Once such term often used is "POV". In the military, this means "car" or Privately Owned Vehicle. You may even ask, "Why don't you just say 'C-A-R?' " Many of these terms do not make sense when used in civilian life, but as explained below, these acronyms and terms used military and veterans alike become second nature in a relatively short period of time while on "active duty". In the U.S. military, there are some basic terms that describe military life and how the infrastructure works. Most people are familiar with the term "active duty" although they may not be entirely clear exactly what this means for the member of the military, and, how this differs from being deployed. The Department of Defense (which is the agency that oversees every branch of the U.S. military) definition of active duty in the U.S. military is pretty straightforward. Active duty refers to full-time duty in the active military, including members of the Reserve Components on full-time training duty. It does not include full-time National Guard duty. Being on active duty is similar to working a full-time job. In the Army, for instance, its active duty soldiers serve 24 hours a day, seven days a week for the length of their service commitment (that's not to say that each soldier works a 24-hour shift, just that there are always soldiers on duty). Of course, each member is offered time off and vacation time, but if the job requires 24 hours of straight work - you will do it if necessary. But like most jobs, if in the States and not deployed, military active duty get weekends and holidays off like every one else in the job force. Deployments for active duty to foreign countries or even war zones occur regularly for the active duty member. Typical cycles are 6-9 or even 12 month deployments depending upon the needs of the military and branch of service. However, coming back home to train or prepare for the next deployment typically allows for the active duty member to be home or training in the United States for at least a year or 18 months. This all depends on the service, type of job conducted by the active duty member, and necessity of the deployment. Deployments do not always mean combat, but in some circumstances, it does. A soldier (or sailor, or airman or Marine) can be on active duty but not deployed, but you won't be deployed unless you're on active duty. Even Reservists or National Guard get "activated" in order to deploy. While a member of the military is on active duty, there are programs in place to help his or her immediate family (spouse and dependent children). In most cases, they can live on the base with the soldier (in the case of the Army). This depends on a few factors, including what unit the military member is with, what their military occupational specialty (MOS) is, and their deployment status. So sticking with the Army example, if a soldier is single, he or she can live in barracks on the base, but a soldier with a family may live in base or off-base housing in the local community. Soldiers on active duty can be deployed anytime, for a period of 12 consecutive months or more sometimes. Soldiers in World War Two deployed for the entire war and could be gone for 4-5 years. For soldiers on active duty, service terms typically last between two and six years, depending on the unit and its mission. Soldiers are eligible for a two weeks of leave after six months of deployment. 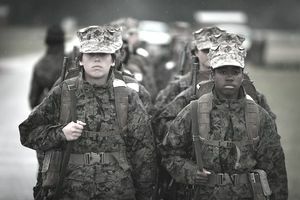 This varies depending on the branch of the service; for instance, in the Marines, the most common enlistment contracts include four or five years of active duty service. In the Air Force, most airmen enlist for a total of eight years of active duty. Reserve soldiers are called to "active" duty as needed, and can hold normal full-time civilian jobs. Army reserve soldiers attend training sessions near their home one weekend per month, and an annual field training. A soldier in the Army Reserve may never see active duty at all during the entire length of his enlistment.